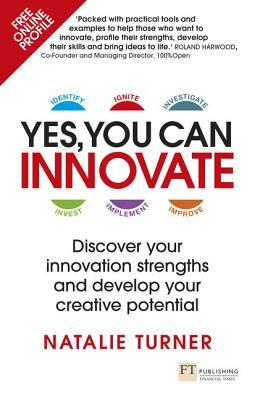 YES, YOU CAN INNOVATE IS A PRACTICAL HOW-TO GUIDE TO HELP YOU DISCOVER YOUR INNOVATION STRENGTHS. USE THE FREE ONLINE ASSESSMENT TO IMPROVE YOUR ABILITY TO CREATE VALUE OUT OF NEW IDEAS. Discover the skills required to successfully innovate, how to understand the problem you want to solve, and how to cultivate and implement innovative ideas. Whether you work for an organisation or are an entrepreneur, each chapter will equip you with a practical toolkit containing examples, activities and resources to help you build and improve your innovation skills. TAKE THE FREE ONLINE ASSESSMENT TO UNDERSTAND YOUR INNOVATION STRENGTHS, AND CHALLENGES, AND HOW TO HARNESS YOUR SKILLS, AS WELL AS THE SKILLS OF OTHERS, TO MAKE YOUR IDEAS HAPPEN. "Natalie Turner, whose journey I have observed with great interest and admiration for over a decade, has written a remarkable book which is offering a path through the jungle of innovating that is both easy to understand, and practical in its application. One important aspect where it differs from other innovation books is that it brings together the different stages of the innovation journey (process) with the different mindsets (people) that are required at each stage if we are to succeed. Structured around her Six 'I's(R) Model - which readers are invited to complete - the book is full of tips, tools and further reading. It should indeed convince everyone that they can indeed contribute to innovation". Natalie Turner is Founder and CEO of The Entheo Network. She has a background in innovation, leadership and marketing strategy and has worked for and consulted with some of the world's leading organisations including Cisco Systems, Singapore Airlines, and LEO Pharma Asia. She facilitates leadership and innovation workshops and is an international speaker on innovation, entrepreneurship and leadership at a variety of conferences, organisations and universities around the world, including Harvard's HPAIR Conference in Manila. Natalie is the inventor of The Six 'I's of Innovation(R) an integrated methodology that provides individuals and organisations a consistent framework for assessing skills and managing innovation. She is an experienced facilitator, trainer and consultant; and works to unlock the potential of organisations and people to help them create new products and services whilst focusing on the development of innovation skills, capabilities and culture. With over twenty years of experience, working in entrepreneurial start-ups, corporate incubators and senior management roles, she is passionate about the application of ideas into tangible, practical and operational results.